Salmon is an easy fish to enjoy and most kids love the taste! Try to find wild salmon to be sure you’re getting the omega-3’s for heart health and to help improve your mood. 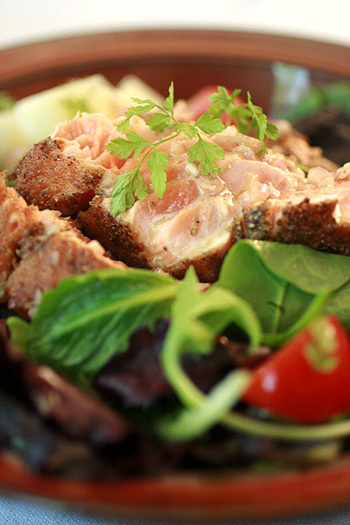 If you prefer the traditional version of this dish, replace the salmon with a fresh tuna steak. In a mini-chopper or blender, mix all the ingredients for the dressing until well blended. Set aside. On a sheet of wax or parchment paper, mix the coriander, pepper, and flour. Sprinkle the salmon with salt. Dip both sides of the salmon in the coriander mixture. Heat a large skillet over medium-high heat and add the olive oil. Add the salon. Cook 5 to 6 minutes per side, until the coating is crispy. Remove salmon from skillet and slice against the grain. In a large bowl, toss the dressing with the greens and spread out on a platter. Transfer the fish on top and serve immediately. Nutritional Stats Per Serving (1/4 pound salmon and salad): 226 calories, 21 g protein, 5 g carbohydrates, 12 g fat (1 g saturated), 36mg cholesterol, 2g fiber, 507 mg sodium.